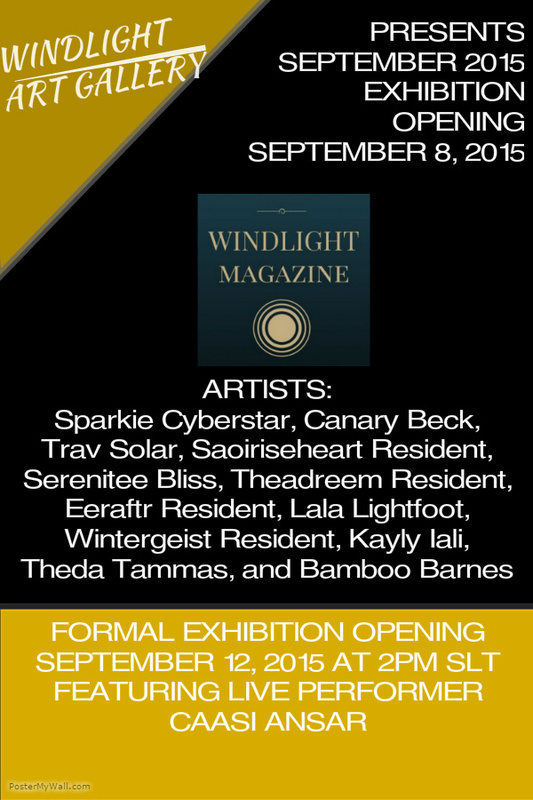 The September 2015 Exhibition at The Windlight Art Gallery will open on September 8, 2015. A formal opening reception will take place on September 12, 2015 at 2pm slt and feature live performer Caasi Ansar. The Artist Fellowship program will provide free gallery space to both new and established artists for a period of 30 days. This program is open to both new and established artists in Second Life. The goal of the program is to provide promotional and artistic resources to artists in Second Life. Windlight Magazine is a publication about the art and photography world of Second Life. The goal of Windlight Magazine is to support artists, photographers, galleries, and related events. John nee Johannes1977 Resident is the Owner, Publisher, and Editor in Chief of Windlight Magazine and Gallery. The magazine is published on a monthly basis.